Flat curtain rods for French doors. One for top, and one for the bottom to hold curtain to door when opening and closing. White finish. Two sash rods per pack on this item. 6415-025: Flat sash curtain rod 48"-86"
Zinc plated slide with steel loop. For grommeted curtains and hand drawn draperies. Graber curtain rod. Instructions for hanging curtain rods are included. White finish. Window drapery rods by Graber. Projection, 2 3/4 to 4 1/4 inches. Clearance 2 to 3 1/2 inches. One pound per foot capacity up to 84 inches in width, 1/2 pound per foot over 84 inches in width. Add supports for greater capacity. Graber super heavy duty features include a universal front loading end bracket, metal adjustable and reversible master carriers ball bearing end pulleys, a spring loaded side gate for adding or removing slides, molded, canted slides, can be converted to one way draw, scored center support base for easy mounting on narrow casings, universal cam lock stirrup, braided polyester cord, and angled tip on overlap arm. Extra long curtain rods. Clearance 3 1/2 to 5 inches, white finish. 2 1/2 inches wide, requires 3 inch rod pocket. The 4 1/2" Continental I curtain rod shown is also available. Brass drapery rods are expensive, the Traditions gives you the brass look without the cost. Rods are metal, slides and finials are plastic. Designed to allow your window curtains to hang below the rod and display the decorative adjustable traverse rod. A window rod to solve your designer needs. project 3 1/2 to 4 1/2 inches, clearance 2 1/2 to 3 1/2 inches. Single standard curtain rods 28-48" projects 2 1/2"
Projection, 2 1/2 inches from mounting surface. 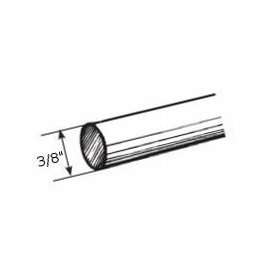 Graber lock-seam curtain rods are made of .013 gauge steel and measure 3/4 x 3/8 inches for extra strength. They are coated inside and out, leaving no exposed edges. For medium to heavy curtain fabrics. 4-221-1: Single standard curtain rods 18-28"
4-223-1: Single standard curtain rods 48-84" projects 2 1/2"
4-225-1: Single standard curtain rods 84-120" projects 2 1/2"
Custom drapery rods by BasicQ. This is an assembled Cut To Measure set. You need to use the order form in the back of the Kirsch price list. Information needed: Quantity, set number, finish, length from selection. Base price includes first three feet. Inches --select-- 0 1" " 3" 4" 5" 6" 7" 8" 9" 10" 11"
2" Chainette fringe, cut yardage price. Projection 3 1/2 inches. For 1" diameter wrought iron curtain rod pole. Used to allow C-Rings to bypass support bracket. Front to back: 4 1/4"